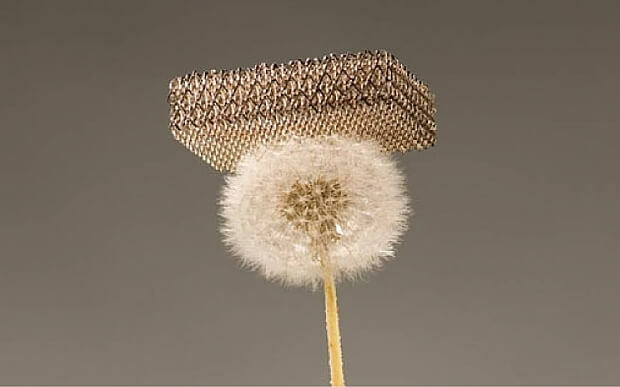 Aerospace Boeing has invented the lightest metal ever, called microlattice. The product is 99.99 per cent air and will be used as a primary component in aerospace engineering – it’ll be used to make space rockets. By utilizing microlattice, Boeing could find ways to cut down on the weight of its jets and save substantially on fuel costs. It’s an important invention, because although it is lighter than foam, as it is made of metal it is very strong. This will save a lot of money in fuel costs while still maintaining a strong structure. The company released an informational video about the material earlier this month, which shows the metal in high definition and explains why it is so important. The structure is comparable to the hollow honeycomb structure of bon, and is is composed of a network of thin, hollow struts. The struts are around 100 micrometers in diameter and have walls just 100 nanometers thick. Microlattice was first announced in 2011 by a research team consisting of scientists at UC Irvine, HRL Laboratories and Caltech. It can sit on top of a dandelion without crushing the seeds, and if dropped from a height ‘floats’ down to Earth like a feather.